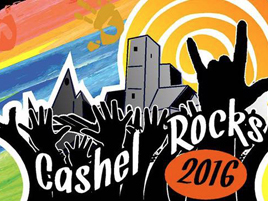 The second Cashel rocks Community Festival will run in the town from 19 – 21 August. The event is a Community Fund Raiser with any profits going to local community groups. The second year of the festival will see it revisiting the successful formula of friday Buskin weekend street performance, Plaza Rock stage and food and craft fair in Dominic’s Court.